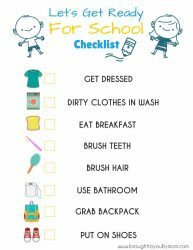 Back to School is here and a morning checklist for kids is a great way to keep kids on track in the morning. If you struggle with getting your kids up and ready for their day, this morning checklist might help. This morning checklist for kids is an easy printable to put on your fridge or anywhere you and your kids can easily see it. From getting dressed to using the bathroom before leaving for the day. Our kids love being independent and doing things on their own. However, keeping them on task can sometimes be difficult. Check out this First Day of School sign to make memories of each new year. A morning checklist helps kids be independent by checking off each task on their own. All while keeping them on task. This morning checklist printable is also very visual with a photo to match each task. This way, it can even be a morning checklist for toddlers. Helping everyone get out the door for school. Print on standard 8.5×11 inch printer paper or card stock. Laminate your checklist so that you can post it and use an erasable marker to check-off every morning. Post checklist somewhere that is easy for your child to access. Throw in a dance party when they complete their morning tasks. Add a chore chart to your routine too with a Preschool Chore Chart Printable. This chore chart is great for preschool to elementary aged kids. With this morning checklist for kids, I hope the morning routine is much easier for you and your kids. A good morning starts with positive attitudes and working together. Help teach your kids independence and how to stay on task each morning to begin their day. Happy mornings to you all!